With a nod to his ancestral roots and a hat tip to modern day aesthetics, this wedding was a wonderful mélange of sentiments and celebrations. As Tithi choreographed wedding dance performances, in the troupe, Abhishek grew fonder of her with each practice. A few months in, he knew he had to do something. 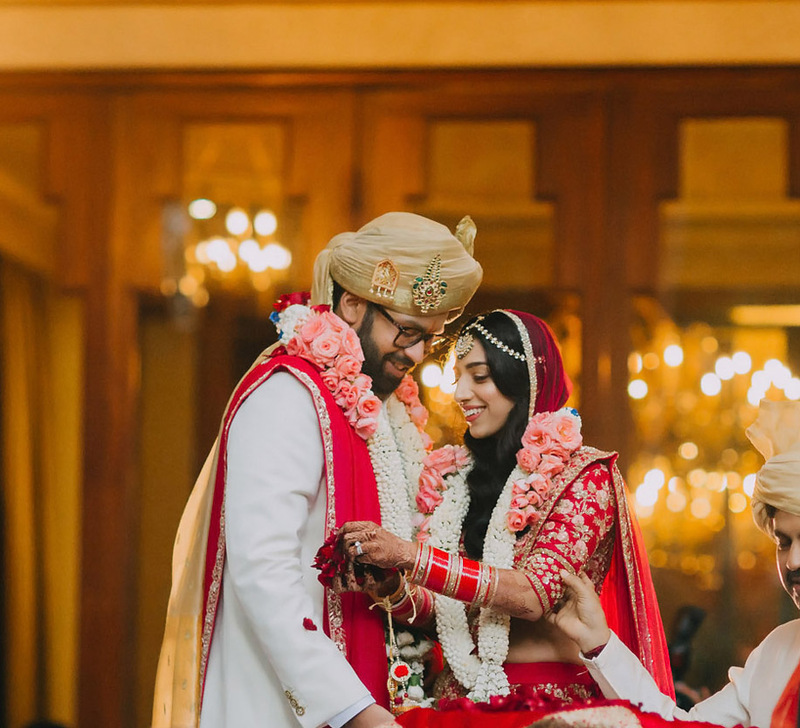 He let his heart take charge and in a while, the couple were planning their own wedding – beautifully captured by WeddingSutra Favorite ShutterDown. Tithi is a dance choreographer and in July 2016, she met Abhishek at a sangeet practice. For him, love came swiftly. Three months later, he drummed up the courage to ask her out. It was only a little while later that they realized their dance together was to last a lifetime. Soon, they were matching steps and planning their wedding. The festivities began in Ladnun, Rajasthan. The idea was to recreate the grandeur of Abhishek’s parents’ wedding, that took place 33 years ago, in his ancestral hometown. After two days of celebration, the party shifted to The Lalit Jaipur. The distinctive spaces at the property, especially their spellbinding courtyard (a charming spot for the pheras), won over the couple’s hearts while its close proximity to the airport won over their logistic planning. Amidst all the hustle and nitty-gritty, Abhishek and Tithi had ShutterDown capture every precious moment of their stunning wedding. Perfectly put together for posterity, the couple and their families know their memories are safe and evergreen. The Barnoli tradition is a quaint, community-driven one. The groom goes through the village at night with 10-20 people and the homes that welcome them leave their porch light on. Abhishek celebrated this tradition as he travelled the streets of Ladnun in a chariot with no fewer than 100 people with him! The scale and enthusiasm he was received with made it a simply wonderful celebration. Before leaving their hometown for the festivities in Jaipur both the families welcomed every family in town to dine with them and bless the couple as they prepared to embark on a new journey. Since it was the first event in Jaipur, the mehndi celebrated Abhishek and Tithi’s love for vibrant colors! The mehndi, disguised as a Rajasthani Carnival was called ‘Mehndi Ro Melo’. Complete with colorful decor, puppeteers, kalbeliya dancers, a tarot card picking parrot and a balloon shooting setup, this one was a lively affair. When dance has played cupid and the bride is a professional choreographer, the sangeet comes loaded with expectation and anticipation! The couple brought Bollywood in with a bang with the theme ‘Jhoom Barabar Jhoom’. The night began with a beautiful singing performance by Anupa Pota, Gargi Vora and team. This was followed by wonderful dances by the duo’s family and friends. The music and movement set the mood of the night and the contemporary décor added a chic edge. Abhishek and Tithi decided to add their own twist to the celebrations. They had all the ladies present at the ceremony have safaas tied. Result? Some truly excellent photographs! After this, there was a ‘Phoolon Ki Holi’ where the bride and groom were showered with flowers. The couple’s wedding ceremony began with a jaimala. The bride arrived in a palki decked with blooms. As they exchanged garlands the stage lit up with fireworks. After this was the pheras ceremony. Held in the magnificent courtyard of The Lalit Jaipur, the mandap stood in the center surrounded by water on all four sides. The heart touching ceremony included Abhishek singing a song for Tithi and his bride reciting her vows to him. Panditji Sri Nirmal Sharma who had them wed offered a lighthearted take on each phera adding to the joy of those present. The couple went with western aesthetics for the reception. The setup included Victorian-inspired dinner tables and a stage with a pink backdrop with floral accents. Music from the band ‘Dunes of Rajasthan’ made the evening unforgettable.